Concise details on the Hiking Tarn Gorges trails tour can be obtained by downloading the tour pdf [right]. Alternatively, read the tour description below and click through the sub-headings in the right-hand column for information on access, accommodation, availability, content and prices. Hiking Tarn Gorges trails offers the perfect short-term total immersion in one of France’s superlative walking experiences – the mythical banks, ridges and trails of the Tarn canyon and adjacent Causses. This essential insight takes you in a clock-wise direction from Le Rozier, on the confluence of the Jonte and Tarn gorges, to the honey-pot village of Ste-Enimie. In between you hike a series of fabulous ridges that are guaranteed to enamour the most spoilt of hikers, with overnight stops in Les Vignes and La Malene. Day Two is a moderate hike along the edge of Causse Sauveterre that will acquaint you with some of the Gorge’s finest architectural manifestations [deserted troglodyte ruins] as well as its finest avifauna: griffin vultures. Days Three and Four of Hiking Tarn Gorges trails provide a choice between leisurely walking along the ridges bordering the River Tarn, or more challenging [moderate] morning climbs up to the majestic Causse Mejean to enjoy the views, before an afternoon decent to your over-night watering hole. The choice is yours and you can make it on the day according to how to fitness and preferences. You have plenty of time to enjoy an optional boat-ride down the Tarn itself and the accommodation comes in standard or superior formats, with the latter comprising a stay in a 17th century chateau with gourmet restaurant. Hiking Tarn Gorges trails is the perfect, flexible short-hiking trip, featuring three days of sumptuous walking that are tailorable to suit you, keeping you fully in control of the overall experience. Note: Please contact us to check for the latest Sterling prices. Sterling prices are confirmed at the time of booking. We transport your luggage, you just carry a light day pack. Remaining dinner [superior] and three lunches; arrival and departure transfers – please ask us for details. The best option to join this programme is via Millau SNCF, from where a regular bus service takes you to Le Rozier in 35 minutes or by taxi in twenty five. Please ask us for details. The nearest airports are i) Montpellier, ii) Rodez, iii) Toulouse or iv) Nimes. i) From Montpellier centre – a train to Millau takes approx. 90 minutes, while a coach takes two hours. 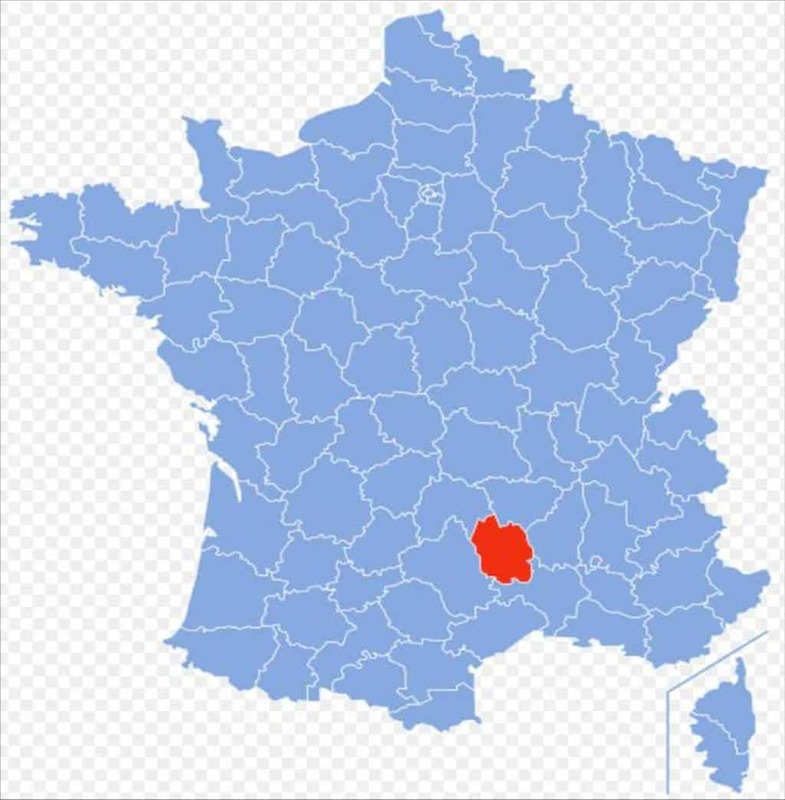 ii) From Rodez – a bus service links to Millau in under 2 hours. iii) From Toulouse – fast train to Beziers and change for Millau. iv) From Nimes centre – fast train to Montpellier, then i) above. Those accessing from the UK and via Brussels can also opt for the high speed train/TGV, which will get you to Montpellier in around 4½ hours via Lille. Best departure option is taxi transfer to Millau – we book it, you pay in cash on the day. Alternative is taxi to Florac and onward bus to Ales [not Sundays] followed by 40 minute train to Nimes. Note: option to split Day Four into two shorter days, especially advisable if you want to take the more spectacular High Route on Day Four, enjoy a swim in the heated pool in St-Chely and have more time to enjoy Ste-Enimie. Please ask us for details. Day 1: Arrive in Le Rozier – where the Tarn and the Jonte converge, and check into your fine hotel on the banks of Le Jonte. Night in Le Rozier. A day to remember. You cross the Tarn and climb through the woods to another fine ridge that leads to the day’s first fascinating troglodyte ruins. No time to snooze lest the vultures mistake you for lunch! Further along you round the Cirque de St Marcellin before discovering its eponymous troglodyte chapel. Sacre Balade! The two options today have equal length but pose different levels of challenge. The light option takes you riverside past Cirque de Baumes and the fascinating lost hamlet of La Croze, whilst the moderate alternative two takes you back up to Causse Mejean. Then why not enjoy a one-hour boat trip down the river in the company of ‘the boatmen of La Malène’ or defer the delights until the next morning? A must! 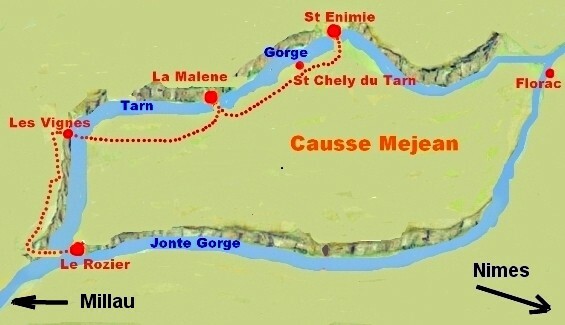 La Malène to Ste Enimie. Two options again, with divergent challenges: the gentle and bucolic valley trail versus the Causse and more superb views from up high. All roads lead to an overnight stay to savour in Ste Enimie. Day 5: Departure day: end of your Hiking Tarn Gorges trails tour – Breakfast, bon retour et à bientôt! Onward journey by taxi transfer – please ask us for options. Options on two days according to your preferences: so much more than just walking along a river bank! The best days involve morning ascents and afternoon descents - well worth the extra [moderate] effort! This is vulture country - watch out for your sandwiches! Enjoy exploring Les Causses Mejean & Sauveterre, with the opportunity to walk both limestone table-top and the deeply-incised canyon."